In a past post I have expressed my dislike for Gillott nibs -- they are a challenge. But I had a few on hand that I thought I would try again. I do love how pretty they look -- those dark blue nibs look so elegant. I did find a Gillott nib that I liked, the 404. The contrast between thick and thin is not as dramatic but sometimes that is needed for certain styles or looks you want to create. The nib is on the stiff side and you can write a lot with one ink dip so this nib might be a good one for envelopes. In the past, I have found that Gillott nibs are not as sturdy and do not keep well, they get brittle and break when kept in storage for a period of time. This is especially true of their very fine and smaller nibs like the 290, 291. I'll keep practicing with this nib and I will experiment with the other Gillott nibs; when I have a chance, I'll report back. In the past, I have volunteered as a photographer for the Portland Fruit Tree Project, a local nonprofit organization in Portland, Oregon. They recently used a photograph that appears in the Willamette Give Guide (print and website) that I took. The Portland Fruit Tree Project's volunteers will harvest fruit trees in the Portland area who's fruit would otherwise go to waste, fall on the ground, and rot. People who volunteer to help with picking the fruit get a portion of that day's harvest and the remainder is donated to another local nonprofit like a food pantry or an organization that could use the fruit to feed others. Please consider donating to this wonderful organization or if you live in the Portland area consider volunteering for an upcoming harvest. If you live in Portland and have a tree that you would like for them to harvest, register your tree here. 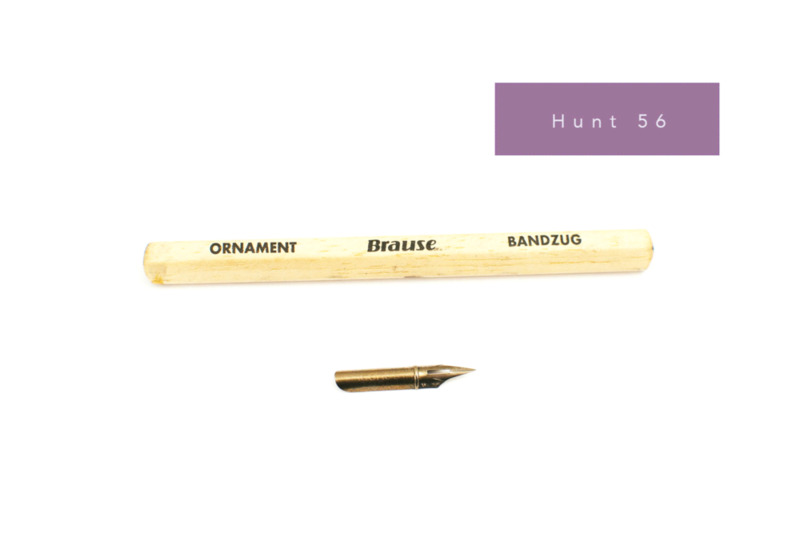 Here is a guide sheet from Speedball about their Hunt brand calligraphy nibs. I'll be reviewing some of these nibs in the upcoming posts but I'd thought you'd find this helpful to see Sppedball's recommendations and descriptions of their various nibs. Starting a calligraphy practice can be an overwhelming adventure at first, learning about supplies, inks, nibs, holders, & paper. I like to experiment and try different supplies so I'll share with you my different experiences. Let's start with calligraphy nibs. The thing about nibs, it's sort of like Cinderella and the the glass slipper, nibs are such a personal fit. 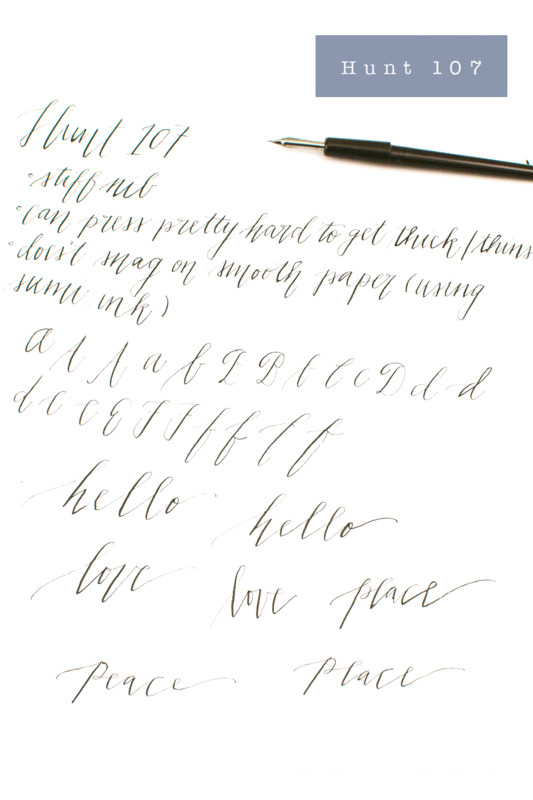 Some things to consider is the amount of pressure you exert when using a calligraphy pen i.e. how hard do you press down when you are writing. 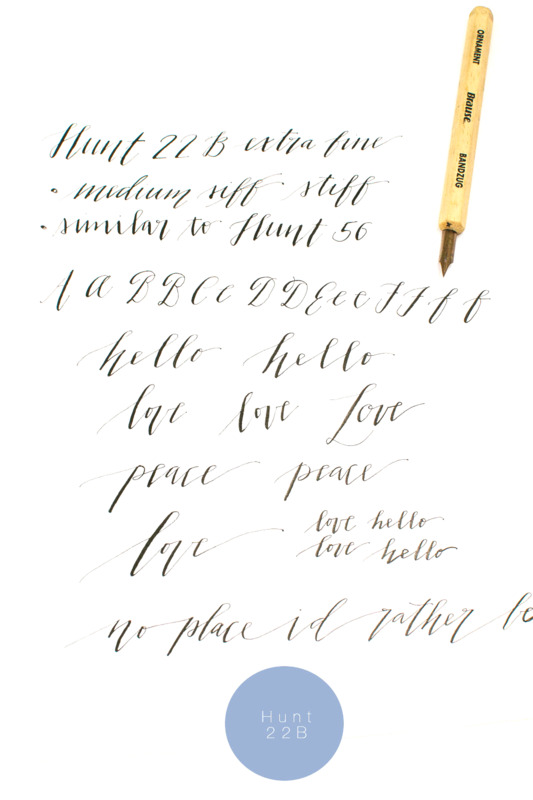 With practice, you can start to control the amount of pressure you use when you write and you learn to adjust the amount of pressure depending on the nib you are using. I promise it gets better with practice. There are some nibs that I simply cannot use and have not learned to master (hello Gillot nibs?). Some nibs need no pressure at all, especially on the thin upstroke, the nib tip is just touching the paper. Other nibs, you need to press down pretty hard to make a mark (both on the upstroke and downstroke) and you will hear more of that scratchy noise when writing. When the nibs tends to be more flexible, less pressure is needed. When the nib is firm or stiff, more pressure can be used to create those thin upstroke hairlines and thick downstroke marks. However, the pressure you use can also cause your nib to snag the paper so you cannot use too much pressure -- or you'll get splatter marks (which I will show you on some of my demos). Nibs are fairly inexpensive so it doesn't cost a lot to experiment and explore different nibs. Paper Ink Arts has this sampler kit of coperplate calligraphy nibs. I'll start off my review with Speedball Nibs (this brand of nib is fairly easy to find), specifically, the Hunt brand nibs made by Speedball which are perfect for pointed pen, modern-style calligraphy. Feel free to share with me your experiences with various nibs and your successes and challenges, I'd love to hear from you what works for you.